5. Epilogue – Job's restoration (chapters 42:9-17). The prologue on earth shows the righteous Job blessed with wealth and sons and daughters. The scene shifts to heaven, where God asks Satan (ha-satan, literally "the accuser") for his opinion of Job's piety. Satan answers that Job is pious only because God has blessed him; if God were to take away everything that Job had, then he would surely curse God. God gives Satan permission to take Job's wealth and kill all of his children and servants, but Job nonetheless praises God: "Naked I came out of my mother's womb, and naked shall I return: the Lord has given, and the Lord has taken away; blessed be the name of the Lord." God allows Satan to afflict his body with boils. Job sits in ashes, and his wife prompts him to "curse God, and die," but Job answers: "Shall we receive good from God and shall we not receive evil?" Job laments the day of his birth; he would like to die, but even that is denied to him. His three friends Eliphaz the Temanite, Bildad the Shuhite and Zophar the Naamathite, console him. The friends do not waver in their belief that Job's suffering is a punishment for sin, for God causes no one to suffer innocently, and they advise him to repent and seek God's mercy. Job responds with scorn: a just God would not treat him so harshly, patience in suffering is impossible, and the Creator should not take his creatures so lightly, to come against them with such force. 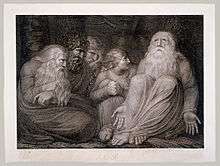 The dialogues of Job and his friends are followed by a poem (the "hymn to wisdom") on the inaccessibility of wisdom: "Where is wisdom to be found?" it asks, and concludes that it has been hidden from man (chapter 28). Job contrasts his previous fortune with his present plight, an outcast, mocked and in pain. He protests his innocence, lists the principles he has lived by, and demands that God answer him. Elihu (a character not previously mentioned) intervenes to state that wisdom comes from God, who reveals it through dreams and visions to those who will then declare their knowledge. God speaks from a whirlwind. His speeches neither explain Job's suffering, nor defend divine justice, nor enter into the courtroom confrontation that Job has demanded, nor respond to his oath of innocence. Instead they contrast Job's weakness with divine wisdom and omnipotence: "Where were you when I laid the foundations of the earth?" Job makes a brief response, but God's monologue resumes, never addressing Job directly. In 42:1-6 Job makes his final response, confessing God's power and his own lack of knowledge "of things beyond me which I did not know". Previously he has only heard, but now his eyes have seen God, and "therefore I retract/ And repent in dust and ashes." God tells Eliphaz that he and his two friends "have not spoken of me what is right as my servant Job has done". The three (Elihu is not mentioned) are told to make a burnt offering with Job as their intercessor, "for only to him will I show favour". Job is restored to health, riches and family, and lives to see his children to the fourth generation. Ascribed by Rabbinic tradition to Moses, it is generally agreed by scholars that the book comes from the period between the 7th and 4th centuries BCE, with the 6th century BCE as the most likely date for a variety of reasons. The anonymous author was almost certainly an Israelite, although he has set his story outside Israel, in southern Edom or northern Arabia, and makes allusion to places as far apart as Mesopotamia and Egypt. According to the 6th-century BCE prophet Ezekiel, Job was a man of antiquity renowned for his righteousness, and the book's author has chosen this legendary hero for his parable. The language of Job stands out for its conservative spelling and for its exceptionally large number of words and forms not found elsewhere in the Bible. 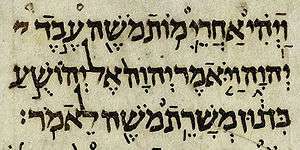 The 12th century Jewish scholar Ibn Ezra concluded that the book must have been written in some other language and translated into Hebrew, and many later scholars down to the 20th century looked for an Aramaic, Arabic or Edomite original. However, a close analysis suggests that the foreign words and foreign-looking forms are literary affectations designed to lend authenticity to the book's distant setting. The book exists in a number of forms: the Hebrew Masoretic Text, which underlies many modern Bible translations; the Greek Septuagint made in Egypt in the last centuries BCE; and Aramaic and Hebrew manuscripts found among the Dead Sea Scrolls. Job, Ecclesiastes and the Book of Proverbs belong to the genre of wisdom literature, sharing a perspective that they themselves call the "way of wisdom". Wisdom means both a way of thinking and a body of knowledge gained through such thinking, as well as the ability to apply it to life. It is attainable in part through human effort and in part as a gift from God, but never in its entirety – except by God. The three books share attitudes and assumptions but differ in their conclusions: Proverbs makes confident statements about the world and its workings that are flatly contradicted by Job and Ecclesiastes. Wisdom literature from Sumeria and Babylonia can be dated to the second millennium BC. Several texts from ancient Mesopotamia and Egypt offer parallels to Job, and while it is impossible to tell whether the author of Job was influenced by any of them, their existence suggests that he was the recipient of a long tradition of reflection on the existence of inexplicable suffering. Job is an investigation of the problem of divine justice. This problem, known in theology as theodicy, can be rephrased as a question: "Why do the righteous suffer?" The conventional answer in ancient Israel was that God rewards virtue and punishes sin (the principle known as "retributive justice"). This assumes a world in which human choices and actions are morally significant, but experience demonstrates that suffering cannot be sensibly understood as a consequence of bad choices and actions, and unmerited suffering requires theological candour. The biblical concept of righteousness was rooted in the covenant-making God who had ordered creation for communal well-being, and the righteous were those who invested in the community, showing special concern for the poor and needy (see Job's description of his life in chapter 31). Their antithesis were the wicked, who were selfish and greedy. Satan raises the question of whether there is such a thing as disinterested righteousness: if God rewards righteousness with prosperity, will men not act righteously from selfish motives? He asks God to test this by removing the prosperity of Job, the most righteous of all God's servants. The book begins with the frame narrative, giving the reader an omniscient "God's eye perspective" which introduces Job as a man of exemplary faith and piety, "blameless and upright", who "fears God" and "shuns evil". God is seen initiating the discussion with Satan and approving Job's suffering, a device which serves three purposes: the usual explanations for suffering, that the sufferer has committed some sin of which he is unaware or that God's actions are inscrutable, are eliminated; it makes clear that it is not Job who is on trial, but God's policy of retribution; and the reader sees that God himself bears responsibility for Job's suffering. The contrast between the frame and the poetic dialogues and monologues, in which Job never learns of the opening scenes in heaven or of the reason for his suffering, creates a sense of contradictory juxtaposition between the divine and human views of Job's suffering. In the poetic dialogues Job's friends see his suffering and assume he must be guilty, since God is just. Job, knowing he is innocent, concludes that God must be unjust. He retains his piety throughout the story (belying Satan's suspicion that his righteousness is due to the expectation of reward), but makes clear from his first speech that he agrees with his friends that God should and does reward righteousness. Elihu rejects the arguments of both parties: Job is wrong to accuse God of injustice, as God is greater than human beings, and nor are the friends correct; for suffering, far from being a punishment, may "rescue the afflicted from their affliction" and make them more amenable to revelation – literally, "open their ears" (36:15). Chapter 28, the Hymn to Wisdom, introduces another theme, divine wisdom. The hymn does not place any emphasis on retributive justice, stressing instead the inaccessibility of wisdom. Wisdom cannot be discovered or purchased, it says; God alone knows the meaning of the world, and he grants it only to those who live in reverence before him. God possesses wisdom because he grasps the complexities of the world (Job 28:24-26) – a theme which looks forward to God's speech in chapters 38-41 with its repeated refrain "Where were you when...?" When God finally speaks he neither explains the reason for Job's suffering (revealed to the reader in the prologue in heaven) nor defends his justice. The first speech focuses on his role in maintaining order in the universe: the list of things that God does and Job cannot do demonstrates divine wisdom because order is the heart of wisdom. Job then confesses his lack of wisdom, meaning his lack of understanding of the workings of the cosmos and of the ability to maintain it. 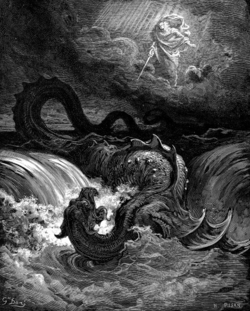 The second speech concerns God's role in controlling behemoth and leviathan, sometimes translated as the hippopotamus and crocodile, but more probably representing primeval cosmic creatures, in either case demonstrating God's wisdom and power. Job's reply to God's final speech is longer than his first and more complicated. The usual view is that he admits to being wrong to challenge God and now repents "in dust and ashes" (42:6), but the Hebrew is difficult, and an alternative understanding is that Job says he was wrong to repent and mourn and does not retract any of his arguments. In the concluding part of the frame narrative God restores and increases his prosperity, indicating that the divine policy on retributive justice remains unchanged. In the Second Temple period (500 BCE – 70 CE) Job began being transformed into something more patient and steadfast, with his suffering a test of virtue and a vindication of righteousness for the glory of God. The process of "sanctifying" Job began with the Greek Septuagint translation (c. 200 BCE) and was furthered in the Testament of Job (1st century BCE – 1st century CE), which makes him the hero of patience. This reading pays little attention to the Job of the dialogue sections of the book, but it was the tradition taken up by the Epistle of James in the New Testament, which presents Job as one whose patience and endurance should be emulated by believers (James 5:7-11). Jewish interpretation of Job was initially positive. He was seen as a righteous Gentile who acknowledged God. Very early, however, Christianity began interpreting Job 19:23-29 (verses concerning a "redeemer" whom Job hopes can save him from God) as a prophecy of Christ, although the major view among scholars is that Job's "redeemer" is either an angelic being or God himself. With Job viewed by Christians as a witness to the coming Christ, the predominant Jewish view became "Job the blasphemer", with some rabbis even saying that he was rightly punished by God because he had stood by while Pharaoh massacred the innocent Jewish infants. 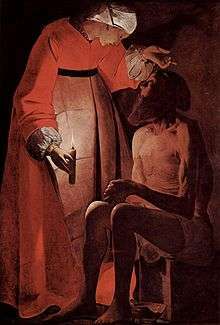 Saint Augustine recorded that Job had prophesied the coming of Christ, and Gregory the Great offered him as a model of right living worthy of respect. The medieval Jewish scholar Maimonides declared his story a parable, and the medieval Christian Thomas Aquinas wrote a detailed commentary declaring it true history. In the Reformation Martin Luther explained how Job's confession of sinfulness and worthlessness underlay his saintliness, and John Calvin's Job demonstrated the doctrine of the resurrection and the ultimate certainty of divine justice. The contemporary movement known as creation theology, an ecological theology valuing the needs of all creation, interprets God's speeches in Job 38-41 to imply that his interests and actions are not exclusively focused on humankind. Jewish liturgy does not use readings from the Book of Job in the manner of the Pentateuch, Prophets, or Five Megillot, although it is quoted at funerals and times of mourning. However, there are some Jews, particularly the Spanish and Portuguese Jews, who do hold public readings of Job on the Tisha B'Av fast (a day of mourning over the destruction of the First and Second Temples and other tragedies). The cantillation signs for the large poetic section in the middle of the Book of Job differ from those of most of the biblical books, using a system shared with it only by Psalms and Proverbs. The Eastern Orthodox Church reads from Job and Exodus during Holy Week. Exodus prepares for the understanding of Christ's exodus to his Father, of his fulfillment of the whole history of salvation; Job, the sufferer, is the Old Testament icon of Christ. The Roman Catholic Church reads from Job during Matins in the first two weeks of September and in the Office of the Dead, and in the revised Liturgy of the Hours Job is read during the Eighth and Ninth Weeks in Ordinary Time. The Book of Job has been deeply influential in Western culture, to such an extent that no list could be more than representative. Musical settings from Job include Orlande de Lassus's 1565 cycle of motets, the Sacrae Lectiones Novem ex Propheta Job, and George Frideric Handel's use of Job 19:25 ("I know that my redeemer liveth") as an aria in his 1741 oratorio Messiah. Modern works based on the book include Ralph Vaughan Williams's Job: A Masque for Dancing, French composer Darius Milhaud's Cantata From Job, and Joseph Stein's Broadway interpretation The Fiddler on the Roof, based on an earlier Yiddish memoir by Sholem Alchem in 1894. Neil Simon wrote God's Favorite which is a modern retelling of the Book of Job. Breughel and Georges de la Tour depicted Job visited by his wife, and William Blake produced an entire cycle of illustrations for the book. Writers Job has inspired or influenced include John Milton (Samson Agonistes), Dostoevsky (The Brothers Karamazov), Franz Kafka (The Trial), Carl Jung (Answer to Job), Joseph Roth (Job), and Bernard Malamud. Archibald MacLeish's drama, J.B., one of the most prominent uses of the Book of Job in modern literature, was awarded the Pulitzer Prize in 1959. Job's influence can also be seen in the Coen brothers' 2009 film, A Serious Man, which was nominated for two Oscars. Terrence Malick's 2011 film The Tree of Life, which won the Palme d'Or, is heavily influenced by the themes of the Book of Job, as the film starts with a quote from the beginning of God's speech to Job. A 2014 Malayalam film called "Iyobinte Pusthakam" tells the story of a man who is losing everything in his life and also has parallels with Dostoevsky's (The Brothers Karamazov). The Russian film Leviathan also draws themes from the Book of Job. The 2015 critically acclaimed novel, The Suffering of Innocents, by Marc Zirogiannis is loosely based on the Book of Job and asks the question, "Why Do the Righteous Suffer?" Job (Arabic Ayyub ايوب) is one of the 25 prophets mentioned by name in the Quran, where he is lauded as a steadfast and upright worshiper (Q.38:44). His story has the same basic outline as in the Bible, although the three friends are replaced by his brothers, and his wife stays by his side. In Palestinian folklore Job's place of trial is Al-Joura, a village outside the town of Al Majdal (Ashkelon). It was there that God rewarded him with a Fountain of Youth that removed whatever illnesses he had and restored his youth. Al-Joura was a place of annual festivities (four days in all) when people of many faiths gathered and bathed in a natural spring. In Lebanon the Muwahideen (or Druze) community have a shrine built in the Shouf area that allegedly contains Job's tomb. In Turkey, Job is known as Eyüp, and he is supposed to have lived in Şanlıurfa. There is also a tomb of Job outside the city of Salalah in Oman. Ludlul bēl nēmeqi the "Babylonian Job"
1 2 Lawson 2005, p. 11. ↑ Seow 2013, p. 87. ↑ Seow 2013, p. 74. ↑ Bullock 2007, p. 87. ↑ Walton 2008, p. 343. 1 2 Walton 2008, p. 333. ↑ Kugler & Hartin 2009, p. 191. ↑ Kugler & Hartin 2009, p. 190. 1 2 Seow 2013, p. 33-34. ↑ Sawyer 2013, p. 27. ↑ Walton 2008, p. 339. ↑ Sawyer 2013, p. 28. ↑ Habel 1985, p. 575. ↑ Kugler & Hartin 2009, p. 33. ↑ Kugler & Hartin 2009, p. 193. ↑ Seow 2013, p. 44. ↑ Seow 2013, p. 1. ↑ Fokkelman 2012, p. 20. ↑ Seow 2013, p. 17. ↑ Seow 2013, p. 21-24. ↑ Seow 2013, p. 1-16. ↑ Farmer 1998, p. 129. ↑ Farmer 1998, p. 129-130. ↑ Farmer 1998, p. 130-131. ↑ Bullock 2007, p. 84. ↑ Hartley 2008, p. 346. ↑ Hartley 2008, p. 360. ↑ Bullock 2007, p. 82. ↑ Hooks 2006, p. 58. ↑ Brueggemann 2002, p. 201. ↑ Brueggemann 2002, p. 177-178. ↑ Walton 2008, p. 336-337. ↑ Hooks 2006, p. 57. 1 2 O'Dowd 2008, p. 242-243. ↑ Barton 2008, p. 336. ↑ Barton 2008, p. 338. 1 2 Seow 2013, p. 97-98. ↑ Kugler & Hartin 2009, p. 194. ↑ Dell 2003, p. 356. ↑ Hooks 2006, p. 329-330. ↑ Fiddes 1996, p. 174. ↑ Walton 2008, p. 338. ↑ Sawyer 2013, p. 34. ↑ Barton 2008, p. 338-339. ↑ Seow 2013, p. 111. ↑ Allen 2008, p. 362-363. ↑ Dell 1991, p. 6-7. ↑ Allen 2008, p. 362. ↑ Allen 2008, p. 364. ↑ Simonetti, Conti & Oden 2006, p. 105-106. ↑ Hooks 2006, p. 250-251. ↑ Allen 2008, p. 361-362. 1 2 Noegel & Wheeler 2010, p. 171. ↑ Allen 2008, p. 368-371. ↑ Farmer 1998, p. 150. ↑ Sheri Hoyte. "Book Review: 'The Suffering of Innocents' by Marc Zirogiannis". Blogcritics. ↑ Zirogiannis, Marc (July 2015). The Suffering of Innocents. Chicago, Illinois: Revival Waves of Glory. p. 1. ISBN 978-1-329-31034-6. Retrieved 10 August 2015. ↑ Wheeler 2002, p. 8. Allen, J. (2008). "Job III: History of Interpretation". In Longman, Tremper; Enns, Peter. Dictionary of the Old Testament: Wisdom, Poetry & Writings. InterVarsity Press. ISBN 9780830817832. Bullock, C. Hassell (2007). An Introduction to the Old Testament Poetic Books. Moody Publishers. ISBN 9781575674506. Dell, Katharine J. (2003). "Job". In Dunn, James D. G.; Rogerson, John William. Eerdmans Bible Commentary. Eerdmans. ISBN 9780802837110. Dell, Katherine J. (1991). The Book of Job as Sceptical Literature. Walter de Gruyter. ISBN 9780899257051. Farmer, Kathleen A. (1998). "The Wisdom Books". In McKenzie,, Steven L.; Graham, Matt Patrick. The Hebrew Bible Today: An Introduction to Critical Issues. Westminster John Knox Press. ISBN 9780664256524. Fiddes, Paul (1996). "'Where Shall Wisdom be Found?' Job 28 as a Riddle for Ancient and Modern Readers". In Barton, John; Reimer, David. After the Exile, Essays in Honour of Rex Mason. Mercer University Press. ISBN 9780865545243. Fokkelman, J.P. (2012). The Book of Job in Form: A Literary Translation with Commentary. BRILL. ISBN 9004231587. Hartley, John E. (2008). "Job II: Ancient Near Eastern Background". In Longman, Tremper; Enns, Peter. Dictionary of the Old Testament: Wisdom, Poetry & Writings. InterVarsity Press. ISBN 9780830817832. Habel, Norman C (1985). The Book of Job: A Commentary. Westminster John Knox Press. ISBN 9780664222185. Hooks, Stephen M. (2006). Job. College Press. ISBN 9780899008868. Kugler, Robert; Hartin, Patrick J. (2009). An Introduction to the Bible. Eerdmans. ISBN 9780802846365. Lawson, Steven J. (2005). Job. B&H Publishing Group. ISBN 9780805494709. Murphy, Roland Edmund (2002). The Tree of Life: An Exploration of Biblical Wisdom Literature. Eerdmans. ISBN 9780802839657. Noegel, Scott B.; Wheeler, Brannon M. (2010). The A to Z of Prophets in Islam and Judaism. Scarecrow Press. ISBN 9781461718956. O'Dowd, R. (2008). "FrameNarrative". In Longman, Tremper; Enns, Peter. Dictionary of the Old Testament: Wisdom, Poetry & Writings. InterVarsity Press. Sawyer, John F.A. (2013). "Job". In Lieb, Michael; Mason, Emma; Roberts, Jonathan. The Oxford Handbook of the Reception History of the Bible. Oxford University Press. Seow, C.L. (2013). Job 1-21: Interpretation and Commentary. Eerdmans. Simonetti, Manlio; Conti, Marco; Oden, Thomas C. (2006). Job. InterVarsity Press. Walton, J.H. (2008). "Job I: Book of". In Longman, Tremper; Enns, Peter. Dictionary of the Old Testament: Wisdom, Poetry & Writings. InterVarsity Press. Wilson, Gerald H. (2012). Job. Baker Books. Wollaston, Isabell (2013). "Post-Holocaust Interpretations Of Job". In Lieb, Michael; Mason, Emma; Roberts, Jonathan. The Oxford Handbook of the Reception History of the Bible. Oxford University Press. Wikimedia Commons has media related to Book of Job.